I recently read the book "The Lost Generation by Nidhi Dugar Kundalia. She describes in the book 11 professions in India that are on their way out; the last of the dying professions. One of the professions she writes about are the Letter Writers of Bombay. When I read that chapter, I remembered that I was once a letter-writer too, though, an unpaid one, unlike the writers of Bombay outside the GPO who were paid for their services. I used to write letters for others. My neighbors. There was Narsajji (Narsamma was her name plus ajji meaning grannny. So Narsajji) and her daughter whose name I've forgotten. Narsajji used to live alone, her two daughters in Bombay. During the weekends, or after school, she would call me or send someone to fetch me. She had a walking stick. 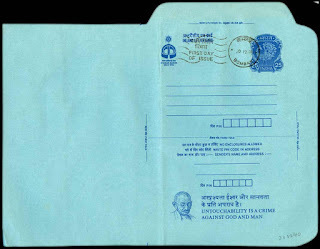 I used to write in Kannada on an inland letter. Those of you who don’t know what an inland letter looks like, here it is. I must have written for them for nearly 5 years till I was in my 12th Std. Strangely, I had learned the alphabets and then to read and write Kannada only in the 4th Std. Narsajji used to give me a guava or a mango for my efforts. Not always, only sometimes. I used to write what she said verbatim. She always talked of how she was doing fine, the coconut yield was low, it has started raining or it is too hot, no water in the well. I remember sitting in the stone bench or what we call in our village in Kannada “jagli” and she would hand me my weapons – a pen and an inland letter. I knew what the opening and closing lines of the letter would be but would still wait for her to say it out loud and match my writing speed with her speech. I would fill the space. She would always ask “is there more space?” A few years later, one of her daughters came and stayed with her as she was unable to move or cook. Now, she commissioned me to write letters for her sister in Bombay. She never gave me anything. I was their official letter reader too. So every time the postman delivered a letter to them which I would know because he had to pass our house to go to theirs, I knew my summons would come. It used to take half an hour for the entire exercise - the reading followed by the writing. For the longest time, the letters were sent to an unseen recipient. I hadn’t seen the old lady’s daughter and family at all. Years later, when they came down, for her funeral, they thanked me and I felt a sense of pride and satisfaction. I wonder who writes for them now! Are they still alive! Does anyone anymore do this? With cheap mobiles and cheaper messages, I don’t think it is even required anymore.Not even in the villages. I have written for others too – only the elderly. But Narsajji was a regular. The others were once in a blue moon clients. I remember sometimes being pissed off and not wanting to go. The letters always read the same, over and over again. It was so repetitive. And I would also need to listen to Narsajji’s complaints of the bad weather, bad crop, bad back, and so on. I detested it as the years went by. But I never stopped. Mostly to please my mother. She hadn’t been to school either and though she had managed to be self-taught, she too struggled with the written word. She would tell me never to refuse. Half an hour of my filling up a blank page meant a lot to Narsajji and her family. There were no phones then. And letters were the only way to know if someone was dead or alive. My mother used to say, "Imagine you are writing it for me, doing a favor to me and do it for them". So I did it. Every time.Twice a month for almost five years. And then we moved houses. Sometimes I wonder if my empathy stems from my mother. I think it does. If it weren’t for her, I would turn out a very selfish, uncaring person like my father. She really grounded me. Not with lectures but just the way she looked at things and people. “Ayyo papa” is a common refrain in my mind when I meet people and hear the stories of their daily struggle. If I had taken after my father, I would have been least bothered. I wouldn’t even have listened to them. But I took after my mother. Stories don’t tire me. What stays is the feeling that there isn’t a lot that I can or could do to alleviate their agony. Mostly a knowing nod is all that I can offer. As the book illustrates, things took a complete turnaround in 2002. In the already thriving mobile communications market, incoming calls became free and Reliance announced its launch. ‘I miss you’ could now be sent in seconds across the country. Priced at a few 100 rupees, mobiles were in the hands of traders and hawkers, and in over a few months, the Letter Writers of Bombay were pushed out of business. India Post stopped the services completely. I think it is good that that happened. No one has to ever ask anyone for a favor of this kind, a personal-to-the-core kind. No illiterate person must ever be obliged to an educated person. Like Narsajji was to me. This article reminded me RK Narayan. I have also done this in my life, but not as regular as you. Completely agree on last paragraph. Nice article which took me to my childhood days of Magadi. In the initial days of the internet, several employees used to visit student labs requesting them to compose e-mail for their children abroad. They would speak in Hindi and the student would transliterate the message in English script. I liked the very last line you wrote...the obliged part. So true. But I miss such personal form of intimacy on paper. Emails, whapping...messages seem so informal...feelingless things. I worte letters for a few aunties and my mom made me write personal messages on her cards for others. Actually ..it made see a different side of them...an unspoken love that came out in their words and I transcribed them in my own simple words. In the end...I jotted down their sadness and love in the same paper. Its an honour and you had so many. Do read the book The Lost Generation. The 11 professions mentioned in it more than half of them I didn't know existed. As for the letter writers of Bombay, they sat outside the GPO and wrote letters for the labourers for a small fee. Beautifully written. You brought the scene before me and I could visualise Narsajji craning her neck as you wrote.It was a small errand for you at your admirable mom's behest but an invaluable help for that old lady. Mothers are great influences on our personality, the kind of persons we become , kind and compassionate. Thank you very much Sir. You captured the essence of the post just as I was beginning to wonder if I was able to make the right point with it. Imagine that ! Trained for future jobs! Wow! I never wrote any letter but I could just see you sitting in the jagli and writing with lots of boredom while I read this. I definitely have experienced the never ending complains of the elderly about how good their days were even though they had hardships and tried to free myself, but like you, it was my mother who taught me empathy for people. How listening to someone rant can make them feel better! Your mother is an angel. She has raised a very good daughter. It is a genuine job, Sujatha.In villages so many 'Narsaji's' were there. It was also a part of villagers' lives.Salute to your humane mother. Last week ! That's quite something! I thought these had stopped.